Signs are managed using the Four Winds Interactive software that is hosted on a Technology Services terminal server. 1. Use a RDP client such as Windows Remote Desktop to open a connection to the server. For Windows, go to the Start menu and type in "Remote Desktop Connection". The program should appear at the top. Please do not confuse this program with "Remote Desktop". For Mac OSX, go to the app store to download and use "Microsoft Remote Desktop". 2. Create a connection to the signage server and connect. The server uses standard campus Active Directory credentials in the format UOFI\NetID. After hitting "Connect" you'll need to enter your credentials. There may also be a warning window that appears, if so hit "yes". You should now be connected to the remote signage server. If this is your first time connecting to the server you'll need to follow the directions below to configure Content Manager to use the UofI database. 2. Wait for the program to launch and then close the program (it may have more than one window open). 4. A window will pop up and eventually prompt you for a response. Type "Y" followed by hitting <enter>. The window will close when it's finished running. You're now ready to use FWi Content Manger! You can reopen Content Manager to start editing your sign(s). 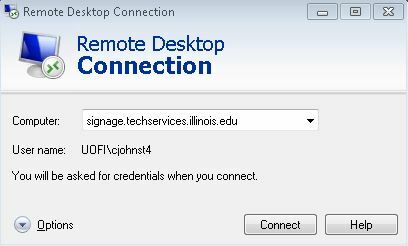 Once you open Content Manager this time, it should automatically connect to the UofI database and you should see your signs. The remote signage server has the shared signage drive mapped to it under drive letter "S:\". This is where digital signage content files are stored. More information about the signage drive and direction on how to map it to your workstation.